Hey girls! If you want to be part of the In Crowd™ and a hit with the boys next summer, now is the time to start dieting! If you're not a size zero by May you might as well become a lesbian - and now your favourite Style Icon™ Barbee™ can show who how to get the look that fashion magazines and celebrities have convinced you you want! All New Bulimic Barbee™ would have a waist measurement of just 16 inches (41cm) if she were real - that's the same as a seven-year-old Ethiopian girl, which is the only size to be if you want anybody to like you. She's So Pretty™ and everything you dream of being. Just think how popular you would be if you looked like her - everyone would want to be your Friend™! Every Bulimic Barbee™ is supplied with a bottle of Magic Slimming Powder™ and a Fat Fighting Feather™ so you can look as good as she does! 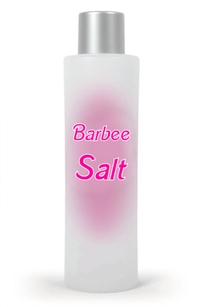 Bulimic Barbee™ comes with a sachet of Magic Slimming Powder™ (ingredients - salt) and a Fat Fighting Feather™. Just mix the Magic Slimming Powder™ with warm water and drink a glassful right after meals before using the Fat Fighting Feather™ to tickle the back of your throat for Almost Instant Weight Loss™ effects. It's easy, and all the cool girls are doing it! Bulimic Barbee™ is priced at just £29.99 (rrp) in toyshops right now - remember, if you don't get a Bulimic Barbee™ this Christmas™ you might as well kill yourself before going back to school, otherwise the bullies will kill you instead! Bulimic Barbee™ accessories - including Lo-Cal Tissue™ to snack on when you just can't go another minute without food, Peachy Shave™ razors to remove the fine, downy hair that will cover your entire body after extreme dieting and Bulimic Barbee™ All-American™ Girl Amphetamines™ - are available separately in all good stores. TELL MOM TO BUY YOU ONE TODAY! IF SHE DOESN'T, SHE DOESN'T LOVE™ YOU SO KILL HER WHEN SHE SLEEPS! FORGET HEALTHY EATING - STOP BEING SO FAT AND UGLY ONLY WITH BULIMIC BARBEE™! This page was last edited on 29 August 2012, at 02:53.